The musical mood: Office des ténèbres, Cristobal de Morales, performed by Doulce Mémoire (available on Spotify or as CD). 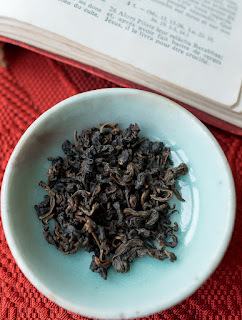 The tea: Spring 1980 Hung Shui Oolong from Dong Ding. The cups: Dehua porcelain cups. 3 modern and 2 early Qing dynasty. 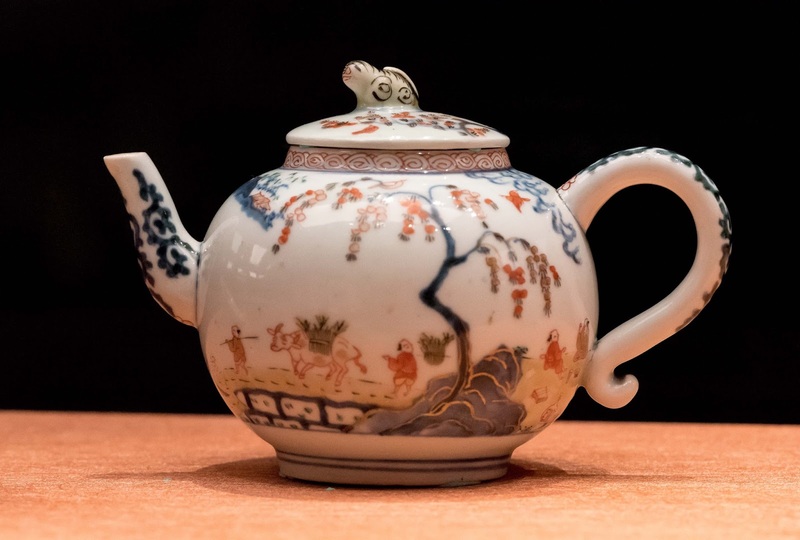 The teapot: an Yixing Tiliang teapot with carved poem and decoration from the 1930s. 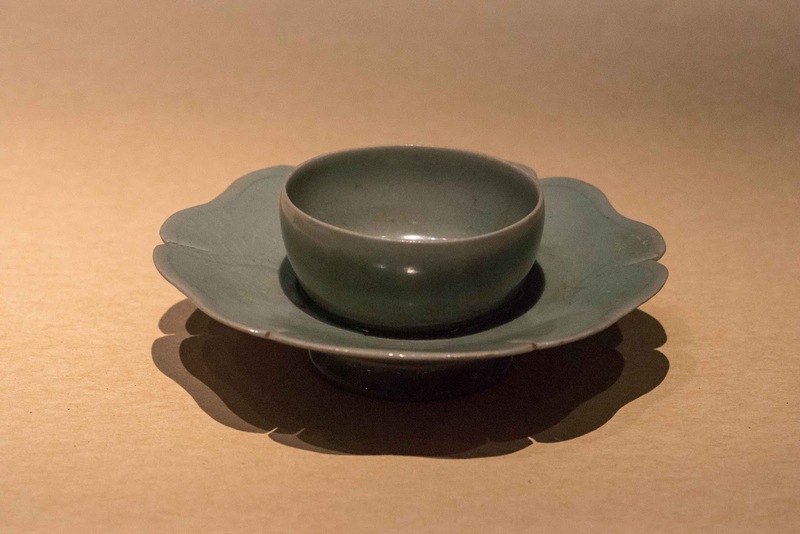 The teaboat: a Sung dynasty porcelain plate with incisions. The tea presentation plate: a late Qing dynasty celadon porcelain plate. The waste water recipient: a Japanese copper Jian Shui. 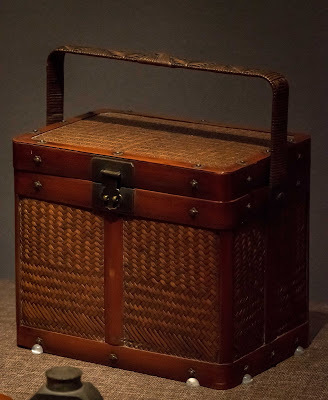 The tea container: a small cylindrical Japanese pewter tea caddy. With this Chaxi, I remember Jesus who died today for my (and all our) sins. 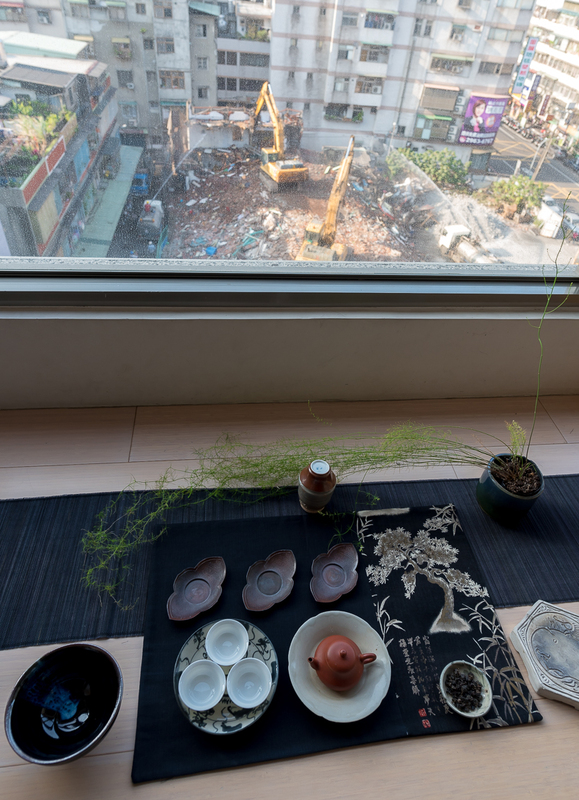 Should I keep this tea ceremony to myself? Is this article going to hurt somebody who doesn't share this faith? Am I showing off with this list of rare, old and expensive tea and wares? Is it wrong to mention my products in an article about Good Friday? I could say that this is just what I do, that I like to celebrate every day with a themed Chaxi. I try to make the most of each occasion and, for a special day like today, I don't hesitate to use my best tea and wares. I'd further say that I don't do any advertising in the sense that nothing is faked, that every feeling is real. 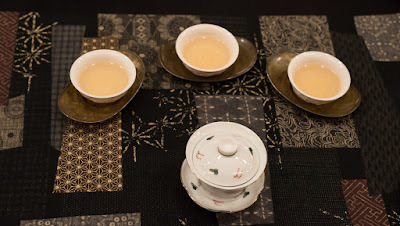 But today let me just confess that there is vanity in my pursuit of tea and that I am too often mishandling the conflicts of interest my tea business has created. And worst of all, I am often not even conscious of where I do wrong, because of my very big pride. I just know some of my words and actions have displeased many readers and customers over the years. It would be painful to list all my failings, my sins, all the things where I come up short. Maybe tea is the one thing that let's me enjoy moments of harmony and unmitigated pleasure! And so, I thank Jesus for forgiving my (and all our) sins on the cross. And you, dear reader, please forgive the dark mood of this article. Actually, the tea tasted divine. 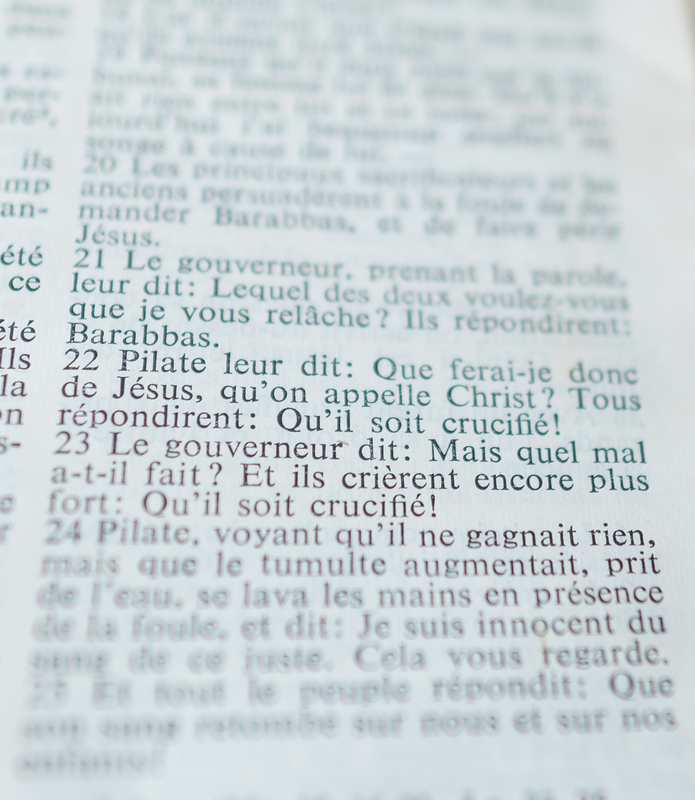 It added life and reality to the account of the events of Good Friday! La période pascale est située au début du printemps. 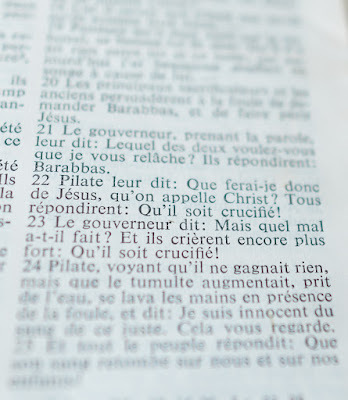 Après la saison morte de l'hiver, Pâques symbolise donc le renouveau qui passe par la mort de Jésus. Mort et vie vont toujours de pair. Mais le message de Pâques va plus loin que la simple alternance de vie et de mort. C'est la promesse d'une vie éternelle pour l'âme. Il s'agit de sortir du cycle des saisons, de l'alternance du neuf et du vieux, du remplacement d'une génération par une autre, pour inviter l'homme à s'élever au niveau du divin et devenir éternel comme Dieu. Dans le thé aussi, chaque printemps marque un renouveau avec ses récoltes de feuilles fraiches. On se détourne alors des précédentes productions pour glorifier, l'espace de quelques mois, d'un an tout au plus, ces nouveaux Oolongs, ces thés verts fleuris... L'excitation va bientôt me gagner moi aussi, au détour d'une plantation resplendissante, aux flancs escarpées d'une montagne baignée de soleil. C'est bien naturel de ressentir l'énergie des jeunes pousses au moment de leur naissance. Mais aujourd'hui je savoure un thé qui me permet de sortir de ce cycle binaire vie/mort. Avec lui je m'élève vers les sphères suprieures de l'intemporel, la poésie et le raffinement artistique. Certes, ce moment ne durera pas plus qu'un Chaxi normal, mais il s'en dégage plus de profondeur et de gravité. 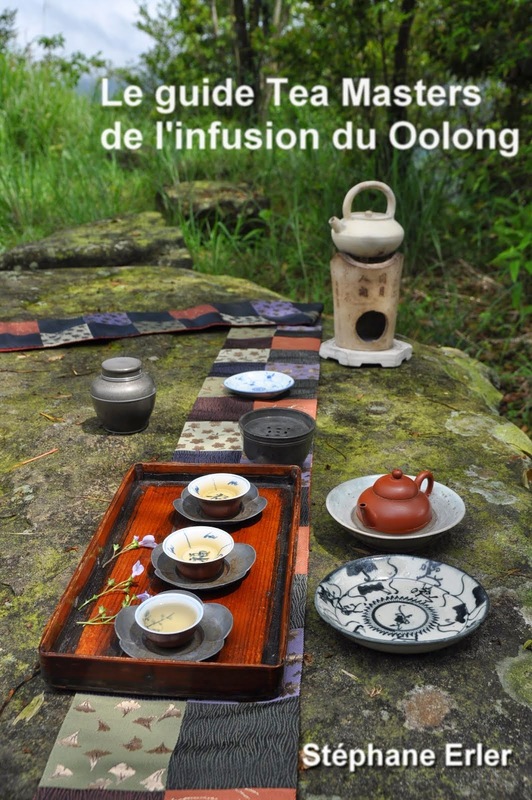 En effet, je prépare un thé de ma famille préférée, un Hong Shui Oolong. Celui-ci vient d'Alishan et date du printemps 2016. 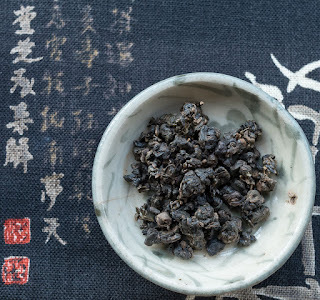 La torréfaction par laquelle passe ce genre d'Oolong est le sacrifice de ses arômes les plus frais et légers. Elle détruit ce qui fait sa jeunesse, mais, si elle est bien faite, la torréfaction préserve justement l'essence de sa fraicheur au plus profond des feuilles. C'est ce que j'adore dans ce thé. Il a ces arômes riches de malt, de noisette grillée, mais aussi une note verte qui semble s'élever des profondeurs de la gorge tapissée de douceur. Quelle harmonie idyllique et quel goût sans fin! Il y a comme comme une sensation d'éternité! 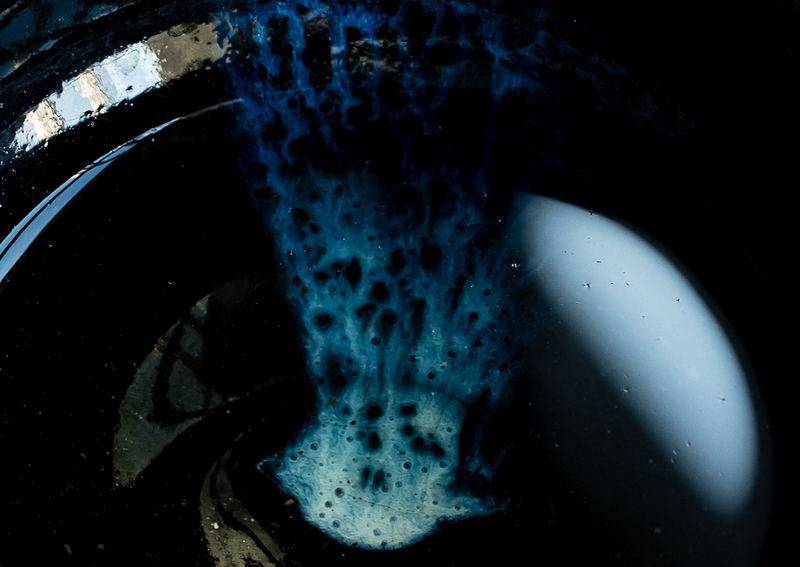 On sent la vie triompher de la mort l'espace d'une infusion... C'est beau comme le 'Miserere mei' de Gregorio Allegri. C'est touchant comme l'héroïsme d'Arnaud Beltrame. Sometimes, tea is just a good excuse to meet very interesting people! Yesterday, I met not 1, but 2 such persons. From what I understood, both are writers and life coaches. They help others improving their happiness level. Whaoh! Are you interested to read how our meeting went and what I learned from them? Let's start with a quick introduction. Below, on the left, we have Tynan, 'king of tech geeks' and on the right we have Leo who writes 'Zen Habits'. Both write extremely well and have published self improvement books. Now, before you get your hopes too high, they didn't tell me the one key secret of a happy life, or the 3 steps to success. 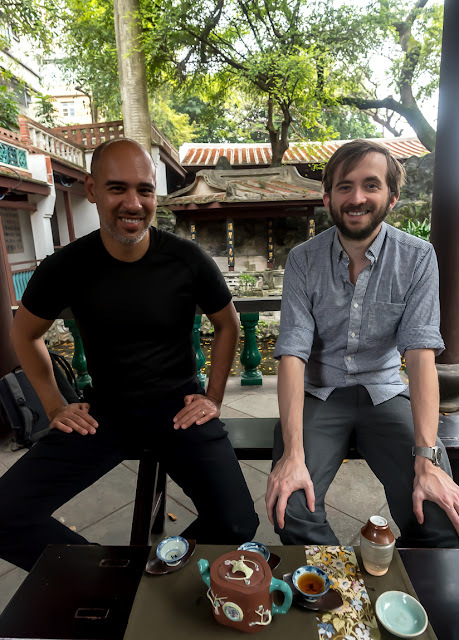 Our meeting was mostly about enjoying a very good tea in a fabulous location. However, I believe that actions speak louder than words. It's one thing to preach, but the real challenge is practicing what you preach. So, even though I was doing most of the tea teaching, I could learn a few things from Tynan and Leo. 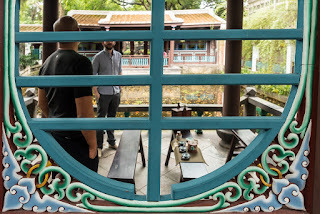 They are travelling the world right now and are enjoying tea in tea houses with a lot of character. 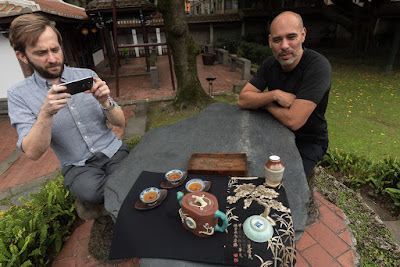 They asked me where they could find something similar to their experience at Wisteria, the famous Japanese era (1895-1945) tea house in Taipei city. Well, look around and see where I have taken you, I answered! This is the Lin Family Mansion and Garden. It predates the Japanese era by 50 years! 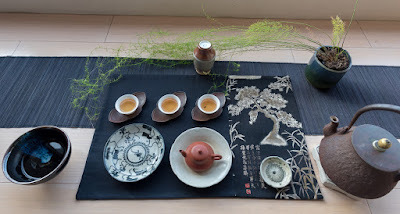 Fittingly, I prepared this Chaxi using Qing dynasty tea ware (the Yixing zisha teapot, the qinghua cup, the celadon plate and the bamboo basket). And in order to feel in harmony with this old place and a cool, cloudy day, I chose to brew my mid 80s raw loose puerh. 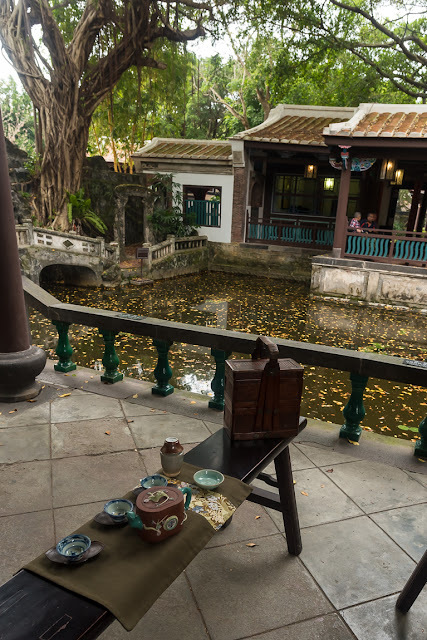 The drawback of making tea in this historical place with lots of wooden structures is that you can't use charcoal fire and that you can't boil your own water with an electric kettle outdoors. As I explained this potential problem to my guests, Tynan right away offered to use his thermos to get hot water. He didn't focus on the negative, but offered a solution. (An advice he offers on his blog is to reframe every problem into a challenge and come up with a solution). That was pretty impressive. But I already had my own solution: a couple of days earlier, I had inquired and made sure that the hot water fountain is still in place in this garden. This would mean that I would have to walk 30-50 meters to get my boiling water. 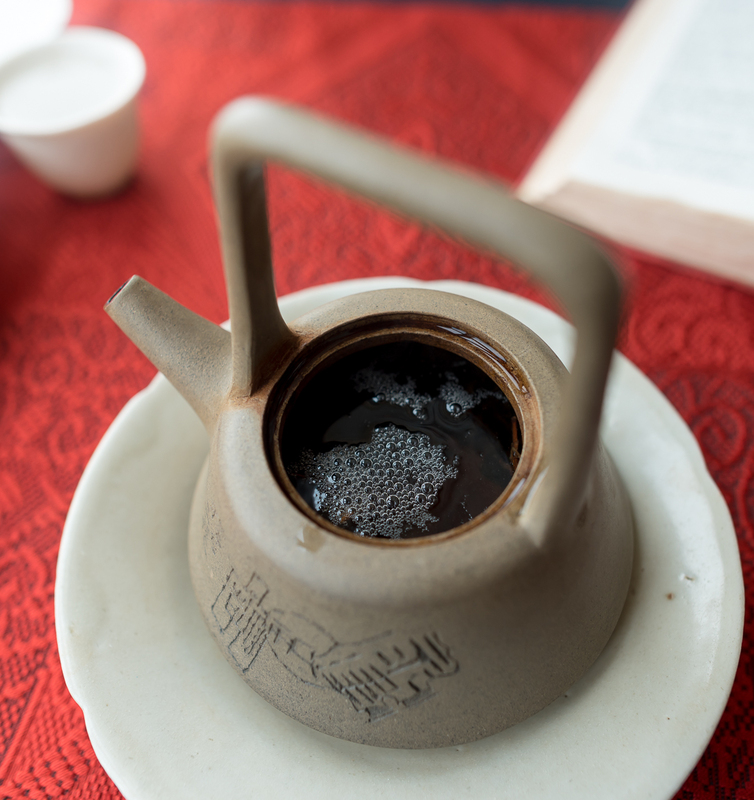 So, to avoid constant back and forth with a small teapot (or even running when brewing gongfu, haha!) I decided to bring my rather big Yixing teapot. This would also mean I needed a tea that wouldn't get bitter /bad when overbrewed. 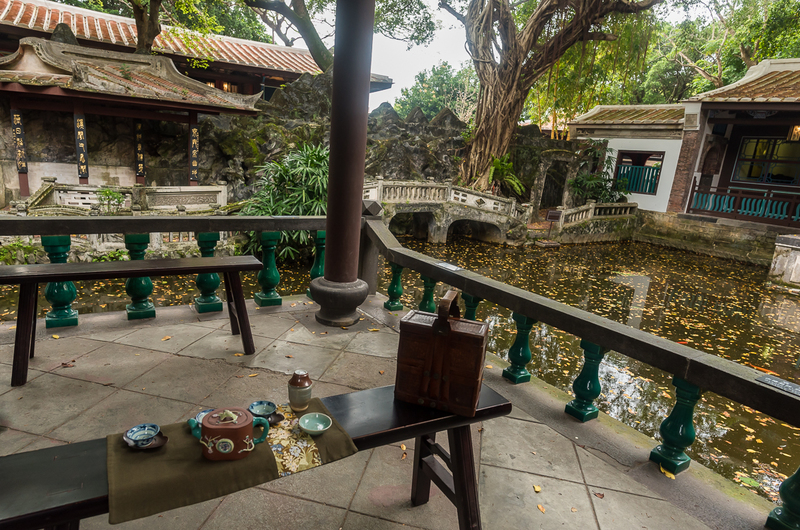 Add the idea of time travel in this antique Chinese garden and it made most sense to bring a very good aged raw puerh. As we finished our first brew, I proposed to move to a second spot. This made me walking to get boiling water less awkward since we were all moving! It would have been a waste to only brew this tea once. 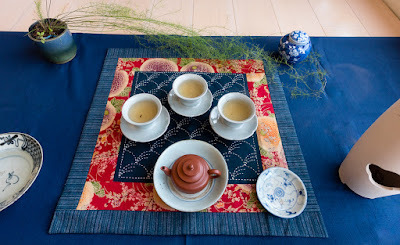 At the same time, I didn't want want to bore my guests with just 1 tea. 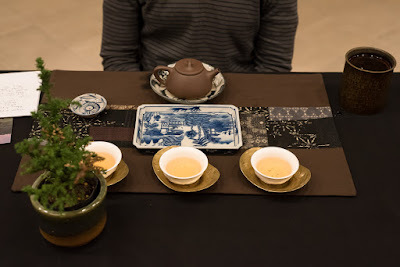 So, a change of scenery and Chabu helped keep this tea interesting. 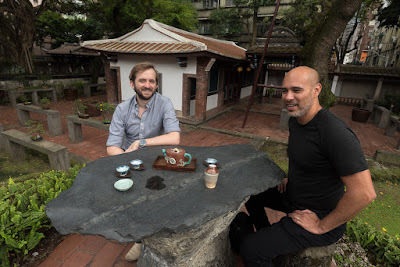 Our cups almost got mixed up during our change of location, but then Tynan and Leo were able to recognize their cups, because each teacup has a different design. This simple fact made them happy and I could tell that they had been paying attention to their tea and to what I was telling them. For instance, I asked them what my tea jar originally was. The answer is in my blog. I gave them time to think about it and almost forgot about it when they asked me to tell them the answer. (Advice: when you do something, put all your heart in it). Before meeting them, Leo had sent me 2 messages (by e-mail and by SMS) to warn me that they would be 5 minutes late. This allowed me to walk slowly to our meeting point and arrive slightly before them. Without these messages, I would have run to arrive on time, because I was also a little bit behind schedule. His kind thought and action let me arrive relaxed at our meeting point, still ahead of them. Leo is the most sunny tea drinker I've ever met. His smile is generous, friendly, warm and caring. They were happy to drink my tea, not just because my tea was good, our surroundings gorgeous and our talk interesting, but because of their attitude. I felt humbled by 2 masters who are incredibly grateful and who are able to focus on the positive while leaving all negativity aside. Thanks for sharing this special moment with me. Have a great journey around the world! And thanks for your interesting writings in your blogs. Addendum: Tynan's take on this experience. Several days of blue skies and temperatures above 20 degrees Celsius have uplifted my mood! Spring is coming early this year, it seems. 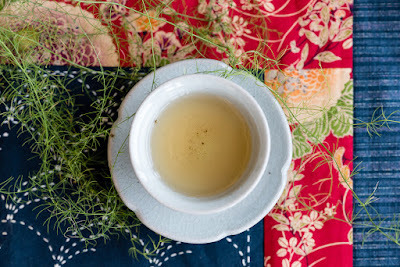 Since the spring harvests are still a few weeks away, I decide to brew a 2017 spring tea that is full of energy, because its leaves have grown on wild puerh trees that have been harvested for the first time last year! The dry leaves have a wonderful sweet bubble gum scent, not the artificial flavors, but the flavor you get at the end of your chewing! There are many other scents in these leaves. The most difficult is to find the right words to identify them. It's like creative thinking: don't repeat what everyone is saying, but let your mind flow freely without fear of ridicule. There are no wrong answers. Our words are necessarily inadequate and limited to describe the millions of scents that our nose can identify! I'm brewing this tea with water that is near boiling temperature. Why such a high temperature? The answer is simple with this tea: because that's how I'm getting the most good flavors and an absolutely amazing aftertaste. Not all teas can stand the heat, but this one can and just loves it! Of course, you still need to control your brewing time in accordance with the amount of leaves you're brewing. 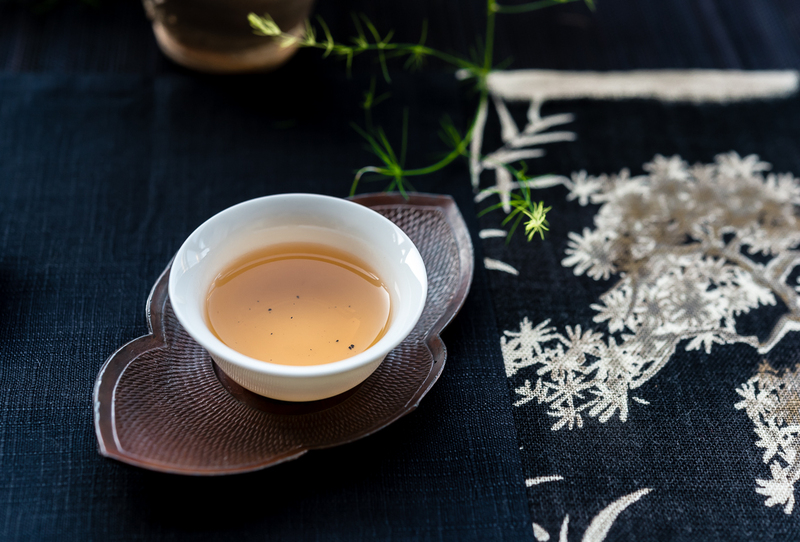 If you use lots of leaves, your brew quickly risks becoming too concentrated. With fewer leaves, it's easier to control the time to pour the tea, I feel. 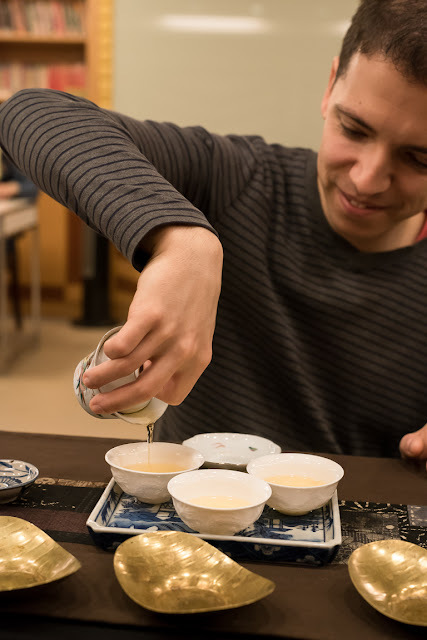 Last week, I tried to explain to the organizer of a tea competition that it makes little sense to use 90 degrees Celsius to brew Oolongs. It's like asking to recite the alphabet on a university exam. Everybody knows the ABC! That's not how you'll let the best students stand out. 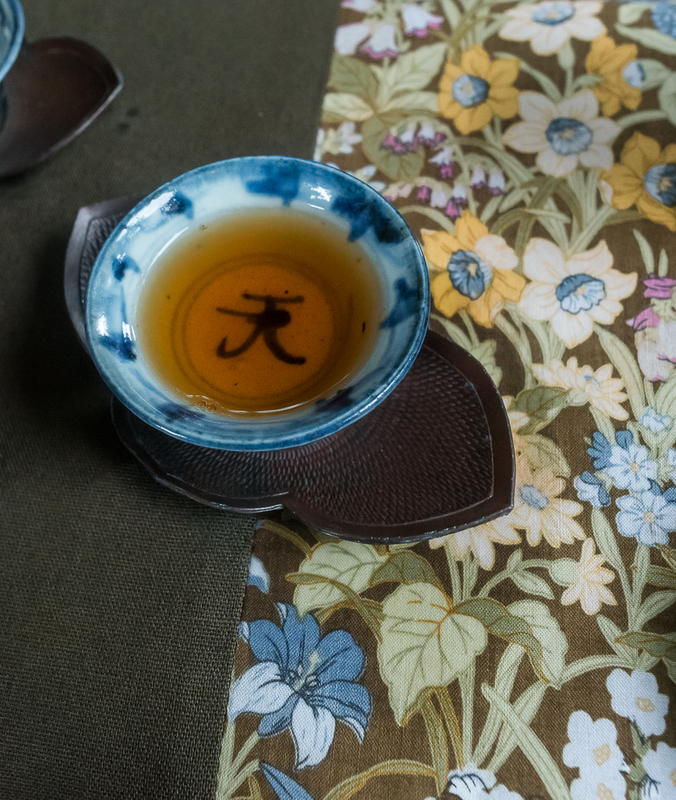 This puerh would loose a lot of its long lasting aftertaste if it were under-brewed. 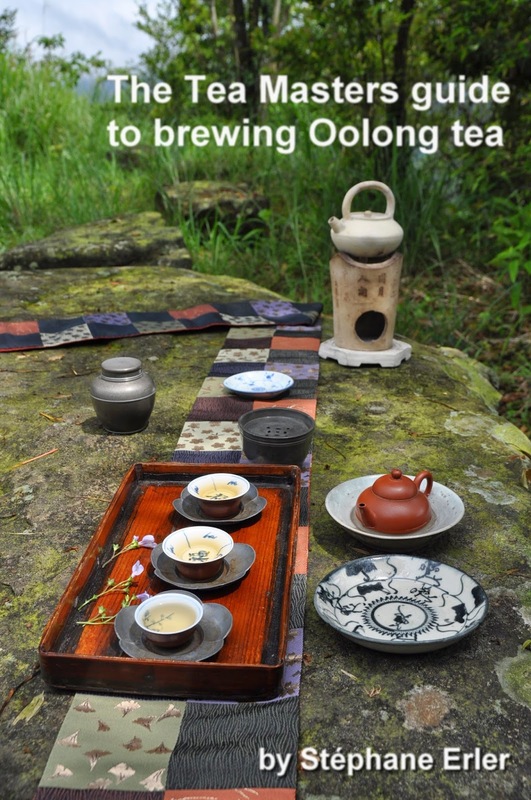 That's why the Dong Ding Oolong competition standard is 3 grams, 150 ml and a 6 minutes brew of boiling water. Most teas won't taste good brewed this way (and should be brewed differently), but those that still taste good are pretty exceptional. I disgress. Let's come back to my spring 2017 puerh. 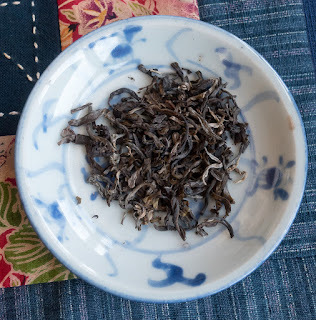 What I particular like about it -and what might puzzle many puerh drinkers- is how pure it tastes and how long it lingers. If we compare it to music, this would be a song sung by a powerful soprano, whereas many puerhs are blends that feel more like a choral with male and female singers. The notes of this puerh are high and stand alone beautifully. I'm celebrating this tea with a blue sashiko Chabu (a gift from my gifted mom), a qinghua porcelain bowl, plate and jar, and celadon cups with stand made by David Louveau a few years ago. 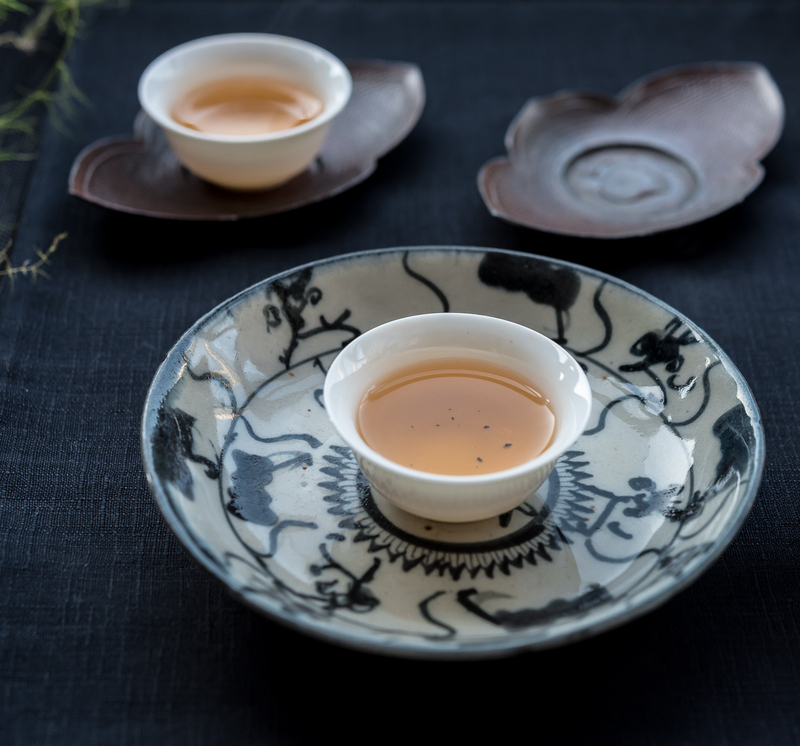 They are inspired by the shape of Yuan dynasty cups and look like a big flower. When I first visited the National Palace Museum in Taipei 20 years ago, I remember that there was a saying that the museum had so many treasures that it would take 10 years to show them all if they would rotate their exhibitions every month! 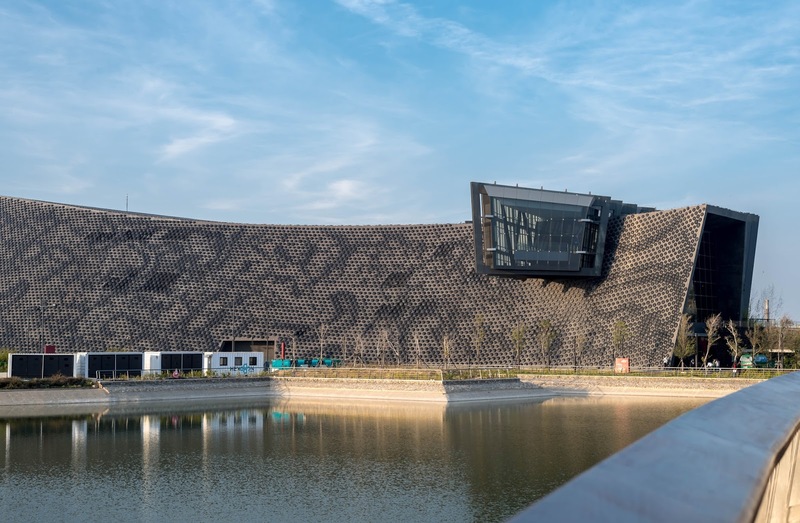 With so many artworks on hand, it really made sense to open a second branch of this museum in Taibo, Chiayi county. 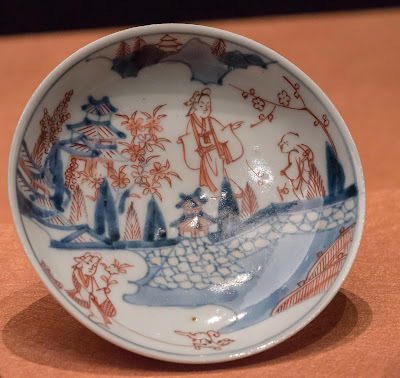 But before I continue with a description of my visit of this new museum, let me briefly remind my readers where all these treasures come from: the collection of Qing dynasty emperors! In 1925, 14 after the revolution overthrew the last emperor, his palace in the Forbidden city was turned into the National Palace Museum. 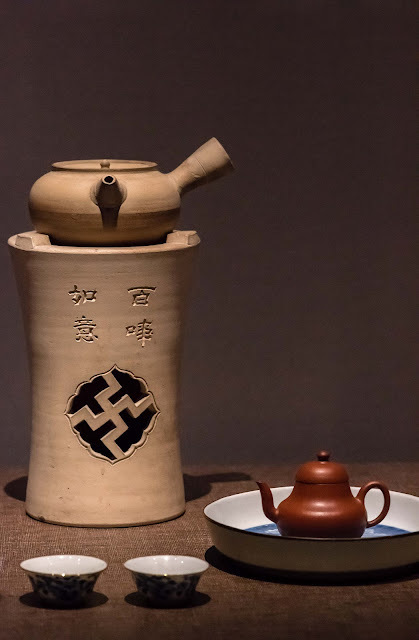 In the 1930s and 1940s, the Nationalist government moved this collection inland, far away from the Japanese and (later) the Communist armies. 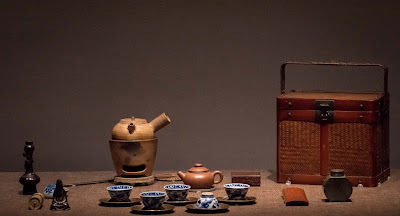 In early 1949, the most prized items of this collection arrived on Taiwan as Chang Kai Shek lost the Mainland to the Communists. The National Palace Museum in Taipei was modeled on the original Palace in Beijing as a link between Taiwan and China's past. The new museum in Taibo has a modern design that looks like a big boat (next to water) that is linking past and present. And while the National Palace Museum never says it's Chinese, the name of this branch is Asian Art and Culture Museum (my emphasis). 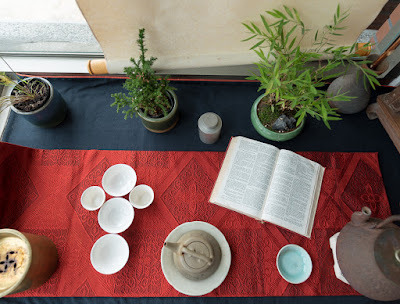 This is the explanation for the Korean tea ware you see here. (Most are loans from the Museum of Oriental Ceramics in Osaka, Japan). 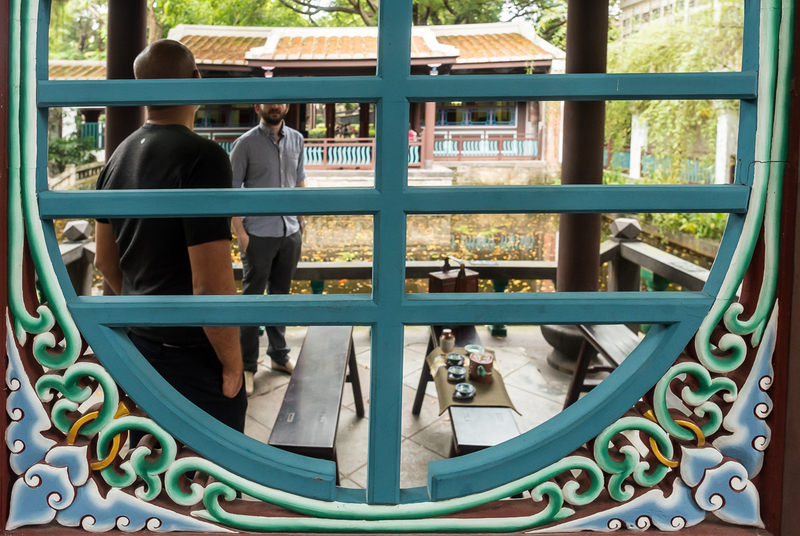 At a time when Taiwan's identity is in flux, with nationalist and independent parties governing in turns, this broader Asian perspective does make sense politically. 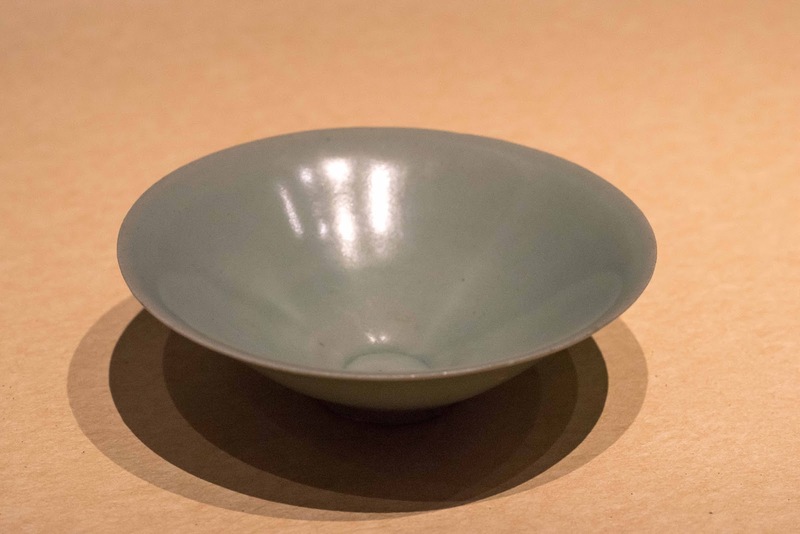 For ceramics, it's also interesting to see how China's Tang dynasty has influenced the shape of the above bowl or how Sung dynasty Ru ware (1086-1125) has inspired the stand below (see pages 12-13 in my British Museum visit pdf). 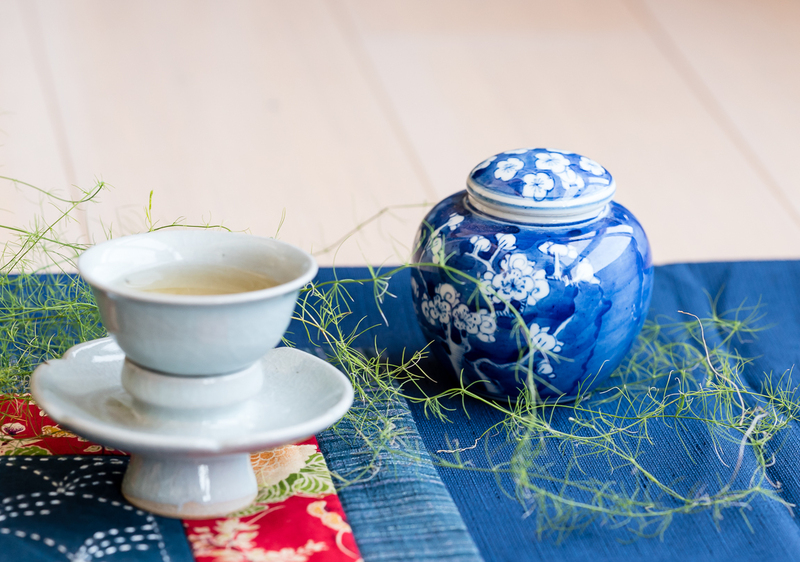 And you can find similar stands in Japan's matcha tea ceremony. 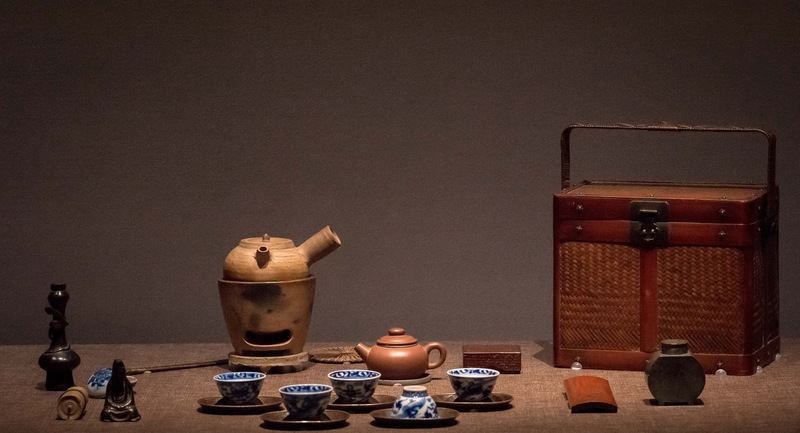 It would be very interesting to put similar items from different Asian countries next to each other to show the common heritage and the differences that arose in each place. So far, however, most of the ceramic exhibitions don't mix. There's this room with Korean wares. It also includes beautiful ewers that are decorated very differently compared to China's. And then there is a room with Japanese porcelain. The influence of Jingdezhen is obvious for a trained eye, but it may escape to most visitors. On the positive side, I liked the tall rooms and good artificial lighting in this modern museum. It also doesn't try to show too many art works. There must still be plenty of material to open another branch or two! It's easy and relatively fast to visit. So, it is a good fit for Chinese tourists on a tour before their 2 hours bus trip to Alishan. 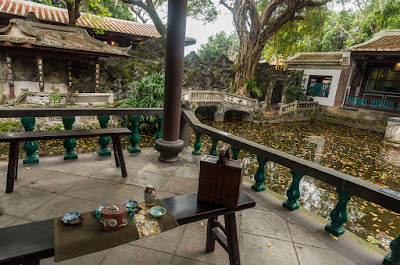 This museum acts a magnet for the small city of Chiayi and actively promotes Taiwan's tea industry. 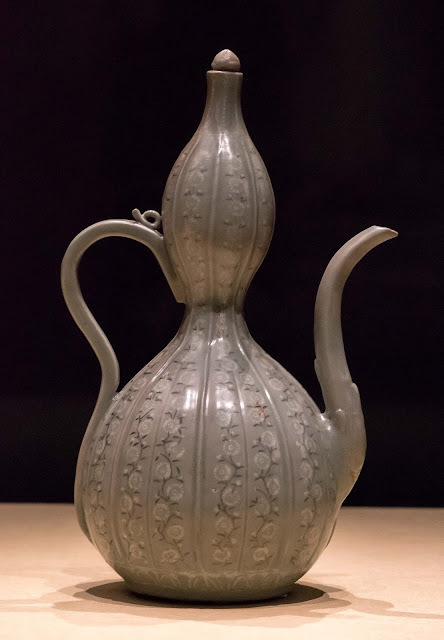 Its straight handle on the side was a popular feature during the Tang dyansty (618-907). This antique ceramic is very important, because it shows what has inspired the shape of Japanese kyusu teapots. Next comes a very good example of how putting bringing wares from different countries together results in new understanding. What do you see? This set looks very much like a Chinese Chaozhou gongfu cha set, but it's a Sencha set from the 19th century! We can see that several items were common to the tea culture of both countries. 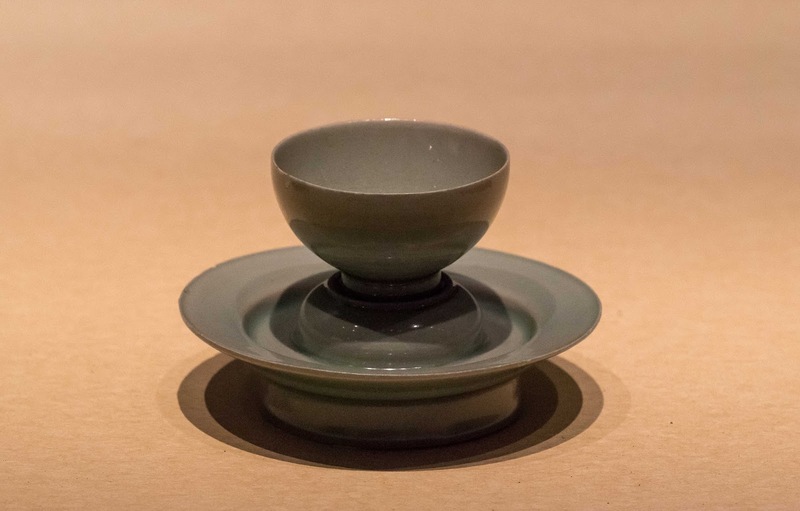 The porcelain qinghua cups are from Jingezhen (or Arita), the pewter tea caddy came from Chaoshan, the teapot has a flat lid (Ju Lun Zhu style) and comes from Yixing. And this beautiful woven bamboo tea basket was made in China. It was an important item, since it helps the brewer store and move his tea ware. 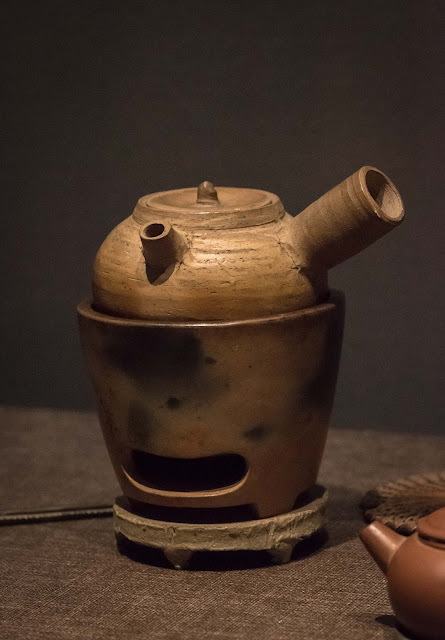 And below we can see the white clay kettle with side handle on a brazier that was used for the Sencha ceremony in Japan. 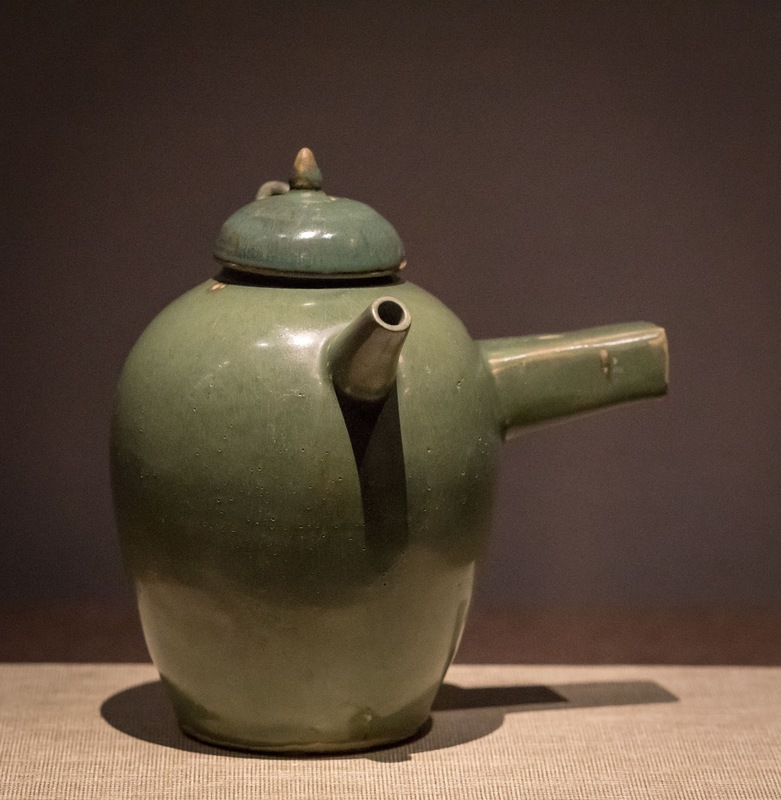 The link with the green Tang ewer is obvious. 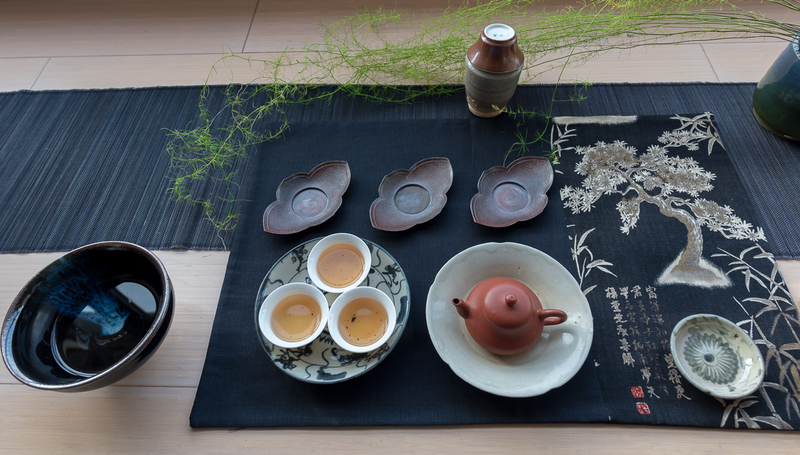 This set below is a Gongfucha tea set. 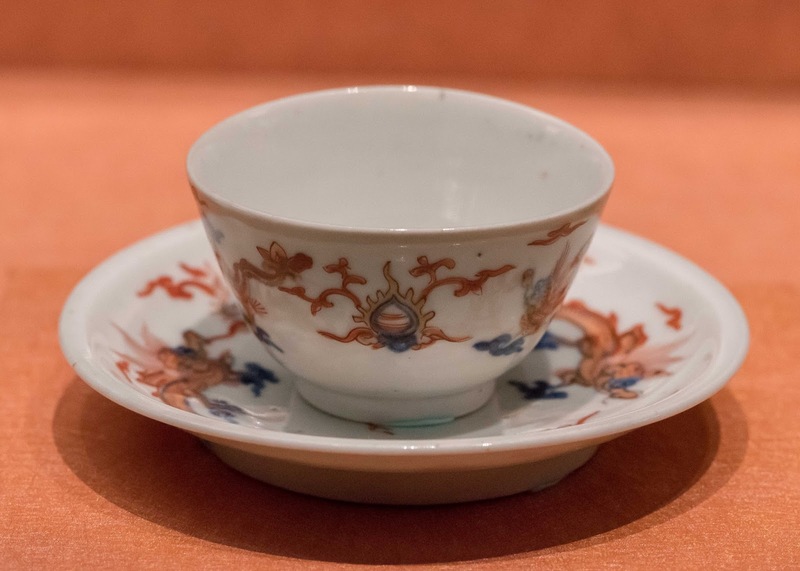 (It comes from a private collection, not from the original palace museum). Placed next to the Sencha set, it shows how tea culture was already pan Asian in the 19th century/20th century and how most gongfucha items were also used, copied or reinterpreted in Japan. 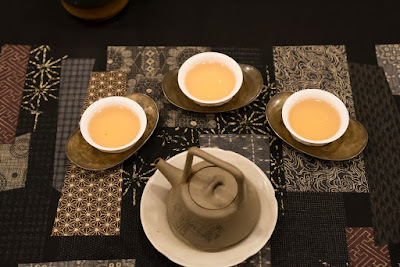 During today's tea class, we brewed the same winter 2017 top Hung Shui Oolong from Dong Ding with 3 vessels: a porcelain gaiwan, an Yixing zisha Shipiao and my old Yixing Duanni Tiliang teapot. We started with the porcelain gaiwan in order to experience the taste and aromas of this tea with a neutral material (glazed porcelain). It's early March and still cool in Taiwan. This season is a good fit for using Yixing teapots to brew tea, because they stay warm longer than porcelain. 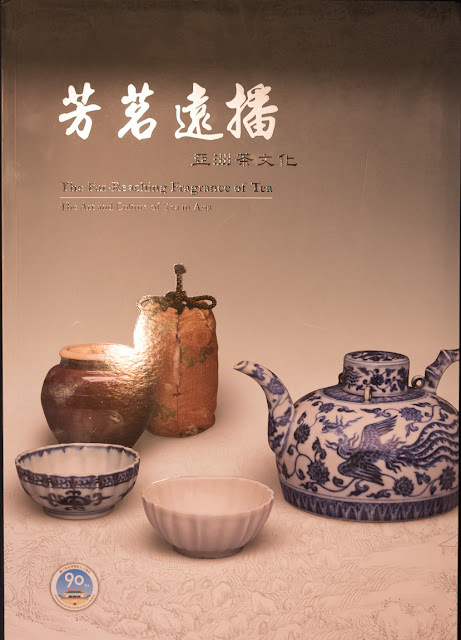 So, even if I recommend to use porcelain to better compare different teas, now is still a good time to understand how Yixing teapots improve roasted Oolong. 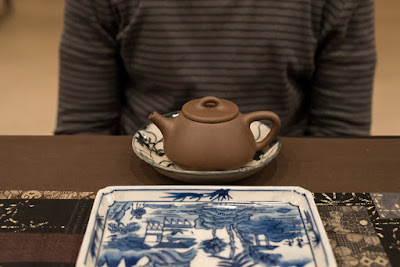 My student Antonio brews the same tea with this zisha Shipiao teapot. The tasting experience is very different from the gaiwan. The first impressions are more muted, more refined. 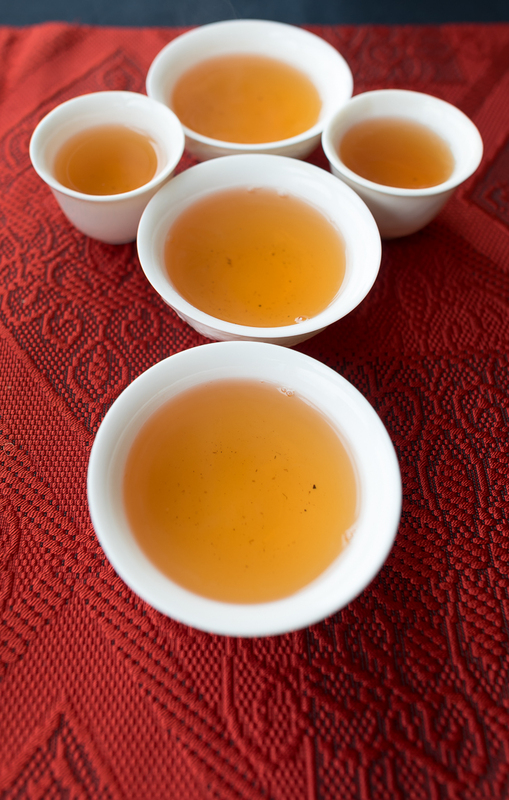 At first, the tea seems smoother and almost weaker, but then the aftertaste builds and builds and builds. Now, the tea feels stronger because it lasts so much longer! The aromas are also a little different. They are not as direct, but seem filtered as if they had been turned into essential oil! In parallel, I'm brewing the same tea with my old duanni Tiliang teapot. (It has a similar shape and size as the zisha Shipiao). It performs very similarly in terms of aftertaste, but the smoothing effect goes beyond what the zisha does and the aromas seem to retain a little bit more freshness. 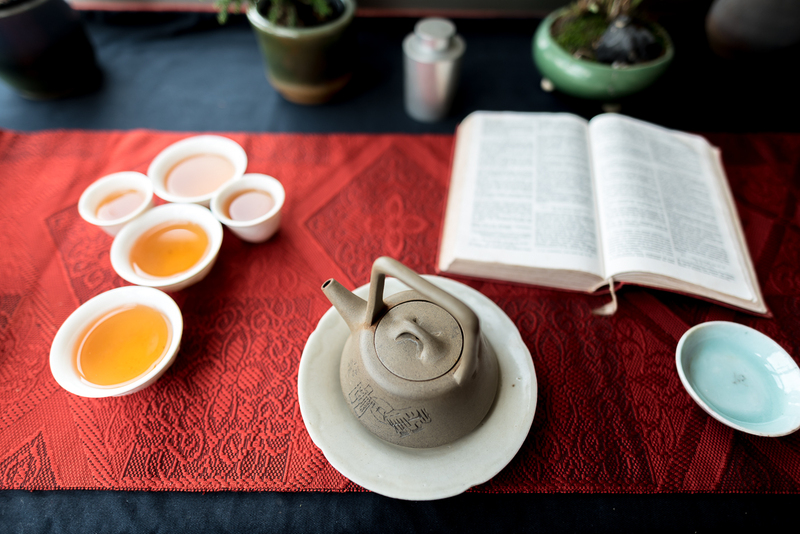 By going back to another brew with the gaiwan, it's obvious that the gaiwan produces lighter fragrances and much less aftertaste because the thin porcelain looses heat much faster than Yixing clay. 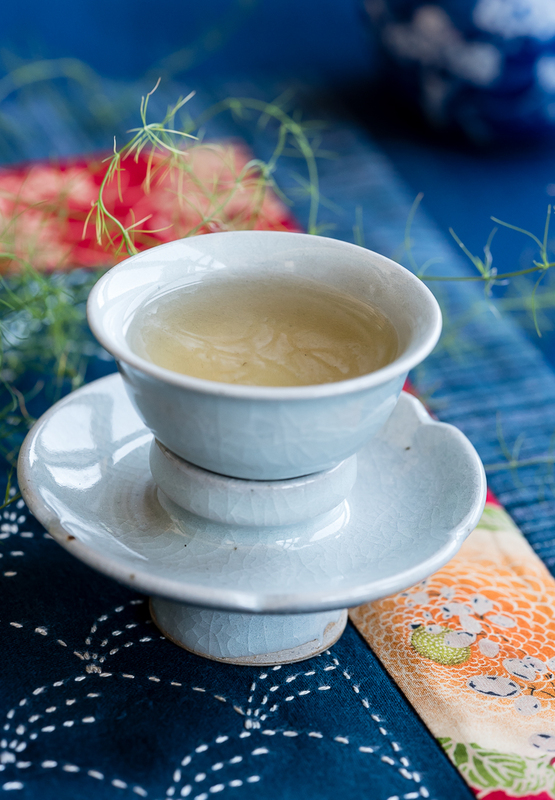 This loss of flavor wouldn't be such loss with a fresh, lightly fragrant green tea or a high mountain Oolong. 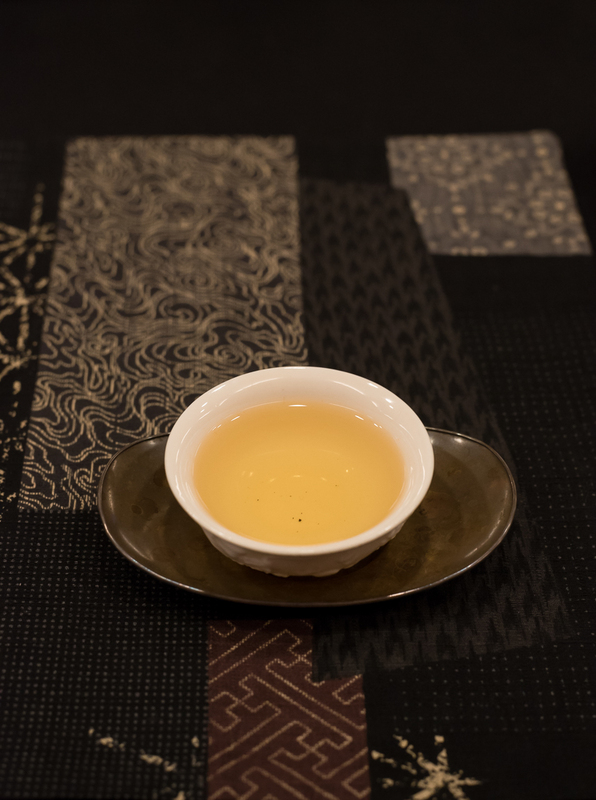 However, for a Hung Shui Oolong, the Yixing clay helps emphasize the long aftertaste which is the core character of this tea. 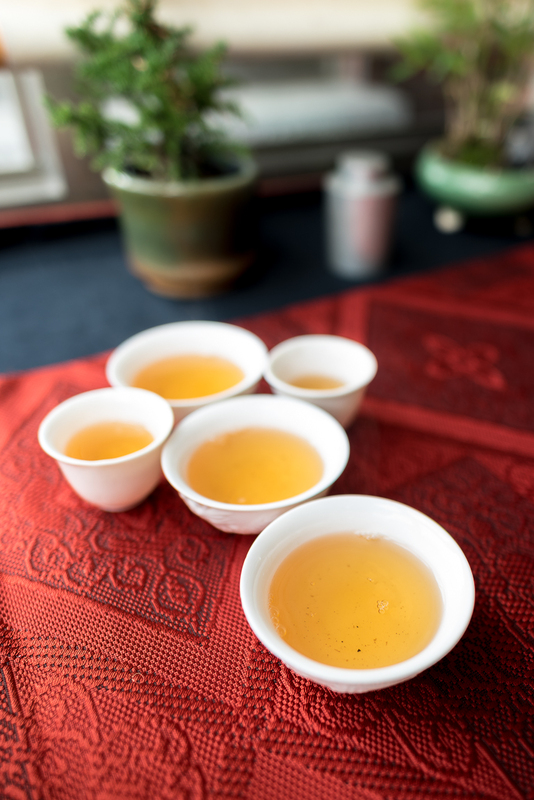 With the right Yixing teapot, we found gold brewing this roasted Oolong!